You'll be £6.00 closer to your next £10.00 credit when you purchase French Army at Verdun. What's this? That is why the selection of contemporary photographs Ian Sumner has brought together for this volume in the Images of War series is so important and revealing. They show the strained, sometimes shocked faces of the soldiers, record the shattered landscape in which they fought, and give us an insight into the sheer intensity of the fighting. At the time, and ever since, the battle has been portrayed as a triumph of French tenacity and heroism that is encapsulated in the famous phrase ‘They shall not pass’. These photographs remind us, in the most graphic way, what that slogan meant in terms of the devastating personal experience of the men on the Verdun battlefield. This is one of the best entries in the Images of War series, painting a valuable visual picture of one of the most important battles of the First World War in a way that written accounts can't quite manage. The year 2016 is the 100th anniversary of the battle of Verdun, fought between February and December. Consequently, the publication of this new addition to the Images of War series is particularly appropriate. This selection of contemporary photographs brought together by Ian Sumner for this volume is both important and highly revealing. They show the strained, sometimes shocked faces of soldiers, record the shattered landscape in which they fought, and give us an insight into the sheer intensity of the fighting. As well as being important images of this battle, these photographs are also invaluable prime source material for the collector, modeller, military historian and re-enactor. The battle has always been portrayed as a triumph of French tenacity and heroism that is encapsulated in the famous phrase 'They shall not pass.' These photographs remind us, in the most graphic way, what that slogan meant in terms of the devastating personal experience of the men of the Verdun battlefield. An intimate and inspirational examination of the greatest of the Great War battles involving the French troops - Verdun. The photographs have an extraordinary clarity that seem to bring the whole thing into a sharper focus. 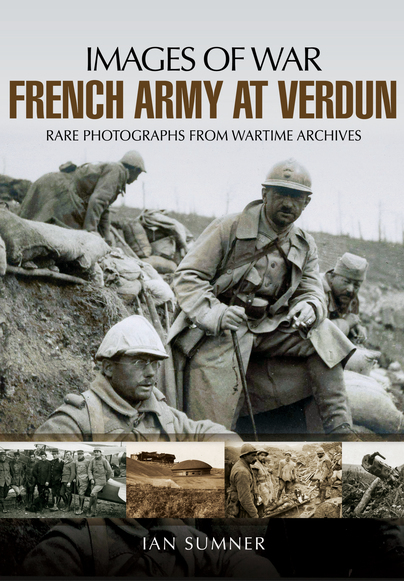 Ian Sumner’s Images: The French Army At Verdun is an excellent overview of the battle from an author with a good track record of books on the French side of the Great War. There are brief chapter introductions but some good photo captions. The photographs themselves are well chosen and show both the French and German side of the battle. The air photos clearly show the destruction the bombardments caused and give an insight into the hell of Verdun: highly recommended.